I am something you least expect. But when I come, I seem perfect. I always make you wonder why. That I’d come out and mess with you. An opposite to your plot. We cannot expect many chances in our life. A chance needs a decision. A good decision seems perfect. We are happy if we used the chance. If we miss it, we are unhappy. A chance creates a feeling of amazement and admiration. In the end, you never knew, That I’d come out and mess with you. We even did't know that we got chances in our life. Everyone will get a chance if something will happen in their life. A chance may change our plans or events in our life. I am something you least expect. But when I come, I seem perfect. You may chuckle, or you may cry, I always make you wonder why. 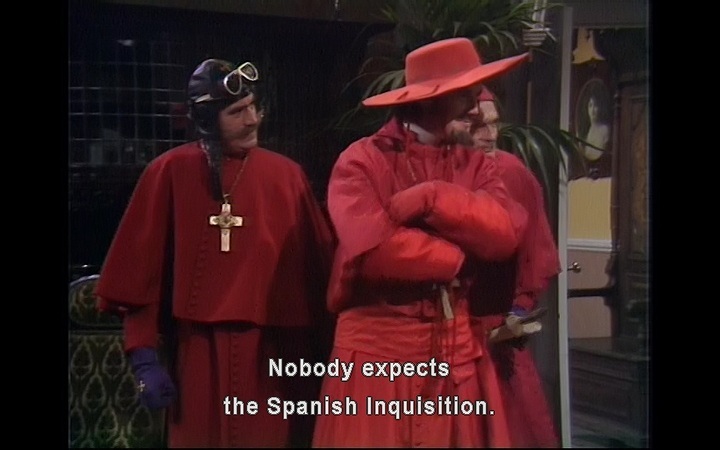 That's funny, but inquisition will have the last laugh. And sometimes you don't know why you've got their attention. Inquisition will surely mess with you. The answer to this puzzle? Something happens, now you’ve got, An opposite to your plot. Never expect somebody to cook this for me. Chicken wings in BQQ sauce are heaven and always welcome. I'll cry when somebody makes me these. I'll chuckle when I take the first bite. They always make me wonder why they are so darn good. I never knew why they are so good. Well you know, on the toilet nr 2. It can get messy when you use BQQ sauce. They usually are, for a short time.. Even parents trying to conceive are pleasantly surprised to learn that their efforts have borne fruit. Most of the time, parents think that their own new-born child is perfect. New-born babies can make their parents very happy, but also sad if unfortunately struck with some disease. Any parents who haven't looked at their kid at some point and wondered "Why???" please raise your hands. Going to assume its more of 'never knew... mess with you', since all parents know the kid is going to come out some day! But yeah kids are usually a much bigger mess than expected. You never knew (suspected) you will be surprised (otherwise it won't be a surprise). A bad surprise can "mess with you". Nobody expects miracle to happen.. When it does, it feels perfect. Miracles make you cry if they're really helping you out. Same for the question why, you'll never know why the miracle happened but it did. You can never know when the miracle is coming. Love often happens out of nowhere. It can make you happy or it can make you sad. It can turn your whole world upside down. Life is your plot. Your partner is your opposite. Inexplicably, Recognizably, Specifically - What am I?